This little book has never been read, and the binding was never broken. Therefore, the binding broke with a snap right in the center when it was opened to be photographed. 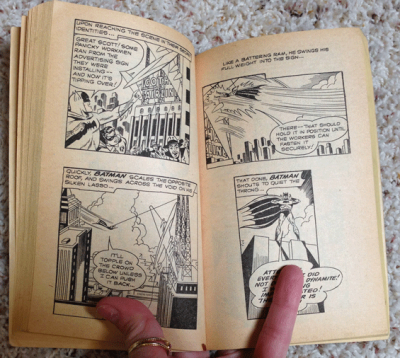 The cover is dog-eared, it has some dog-eared pages and some scribbling in pencil on the inside front and back covers. Two of the pages inside also have some pencil scribbling. 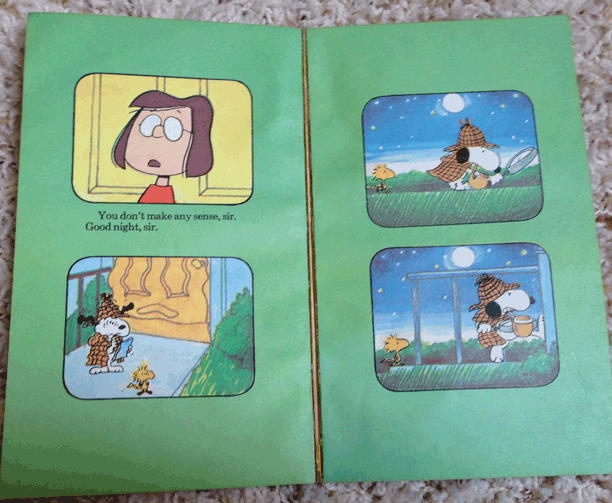 All the page backgrounds in the book are a solid green, maybe just a tad darker than the cover. 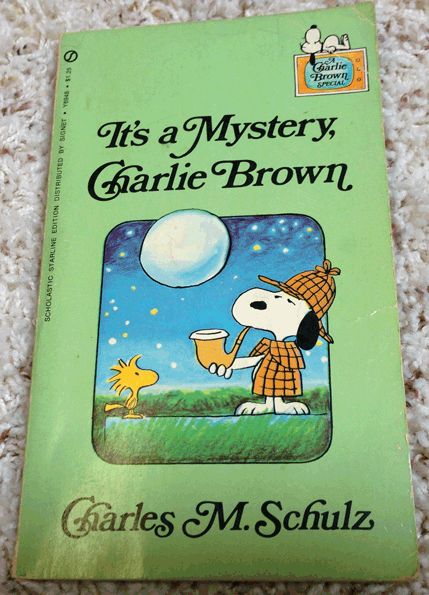 Other than age coloration around the edges, the color and pictures are all in good condition, but the book is difficult to open as it was never broken in. To read it, you would have to break the binding further. From Tempo Books, published by Grosset and Dunlap, Inc., New York, A Filmways Company. 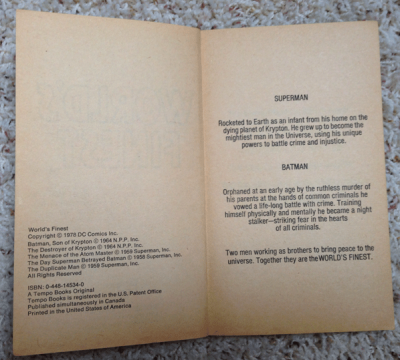 The book is standard paperback size, and has never been read although the front cover and first page has been opened multiple times. The words "Covedale School Library" have been stamped on the inside front cover. 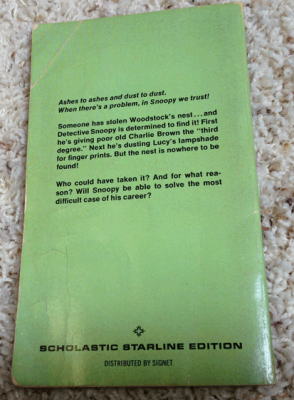 The cover is dog eared. 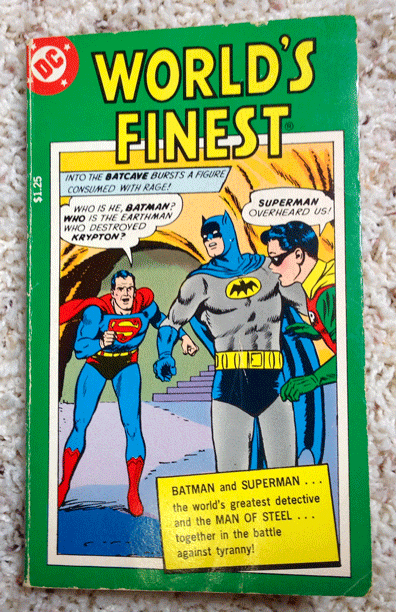 The inside pages have age coloration. Otherwise the book is in good condition. 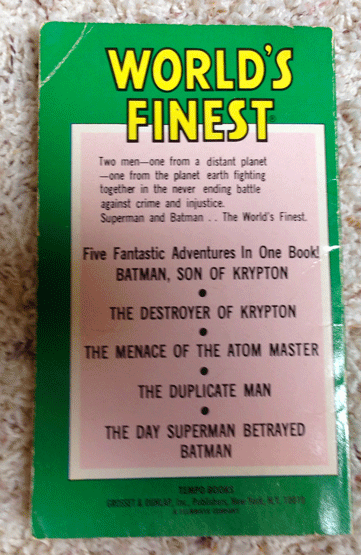 It contains 5 stories about Batman and Superman: Batman - Son of Krypton, The Destroyer of Krypton, The Menace of the Atom Master, The Day Superman Betrayed Batman, and The Duplicate Man. This book is at least 35 years old. You can find more pictures of the book below.